In his book Jerusalem, Ottolenghi describes Ras el hanout as “a spice blend brought to Jerusalem by North African Jews consisting of mainly sweet and hot spices, toasted and ground. There isn’t one definitive recipe, every spice shop in North Africa…has its own ‘flagship’ spice blend with a typical set of secret components.” Since any book I have that uses this spice blend recommends a shop bought one I wouldn’t even dare to try to make it myself! I bought mine in Tesco so it must be fairly widely available. The spice blend contains cumin, paprika, coriander, chilli, cinnamon, dried rose petals… and much more. I was salivating the moment I opened the tin! It packs a punch and would go well with any meat fish or vegetables. 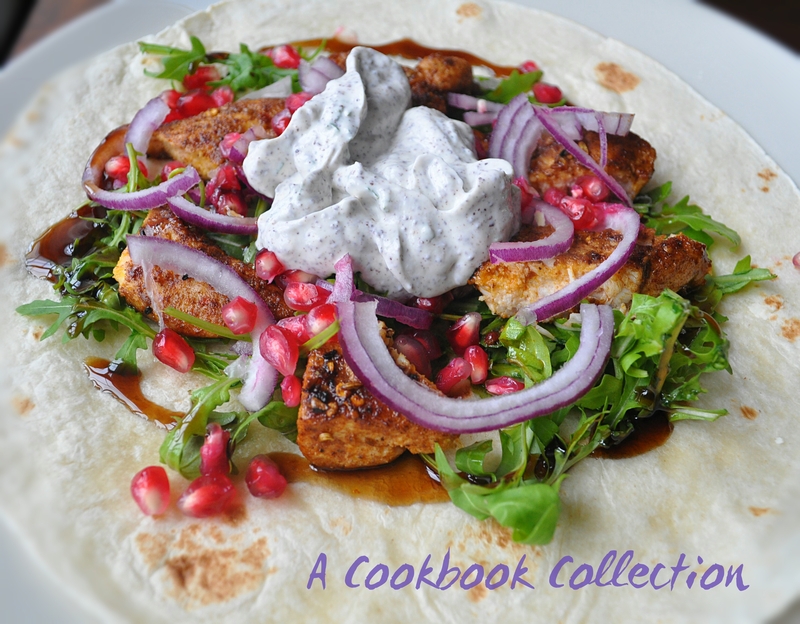 This recipe is from Sabrina Ghayour’s Persiana. I know – again, says you! This recipe was so good I had to share it. It is finished off with a yoghurt sauce. This caused a bit of controversy in our house. I thought it was nice with it and that the wrap needed the moisture but my better half reckoned it diluted the flavour of the chicken and was unnecessary. Maybe serve it on the side so that everyone can add their own to taste. Butterfly your chicken breasts. See this post to describe how to do this. Mix the ras el hanout with a couple of tablespoons of olive oil to create a paste. Rub this paste all over the chicken and make sure it’s completely coated. Sprinkle a little salt over the chicken. Cover with clingfilm and allow it to marinate in the fridge for a couple of hours, max overnight. As the chicken cooks so quickly, make the yoghurt sauce first. Simply put all of the ingredients into a bowl and mix well. Preheat some olive oil in a large frying pan or griddle pan over a medium high heat. Put in the chicken breasts and fry for 8-10 minutes on one side and then 6-8 minutes on the other. When you are happy that the chicken is fully cooked, allow it to rest for a few minutes and then slice it into strips. 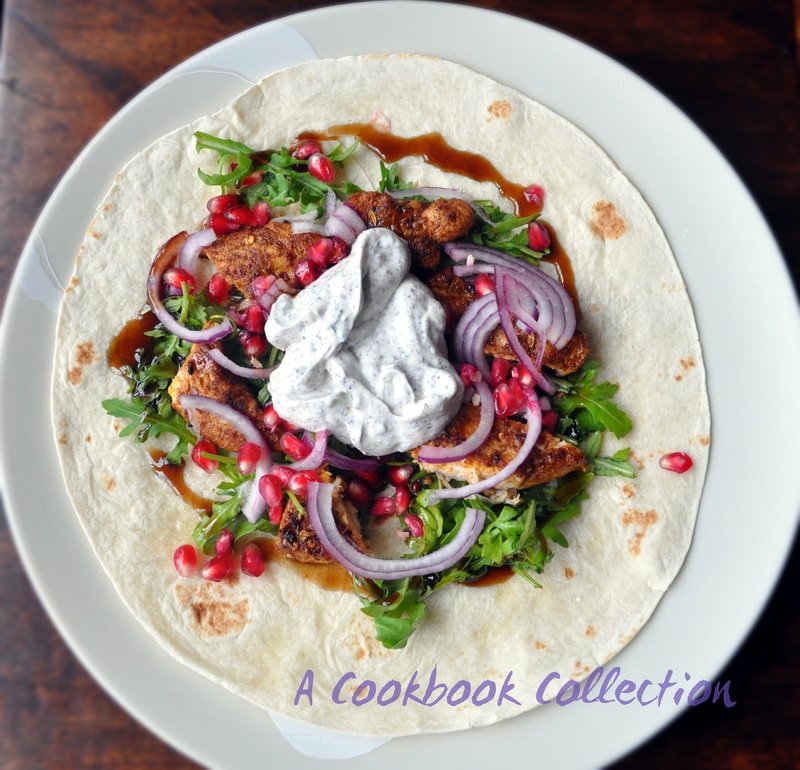 Place some chicken on each wrap with onions, rocket and pomegranate seeds. Drizzle over some of the molasses and add some of the yoghurt or serve it to the side. Roll up the wrap and serve immediately. I served this tomato salad with it. It is ideal for it!